"That's the way Humans amuse themselves. They write books about things they don't understand, and each new book says all the others are all wrong. It's a silly game, and very insulting to the creatures they write about. Humans at the other end of the world, who never took the trouble to come here to see me, wrote books about me. Those who did come were more impudent than those who stayed away. Their idea of learning all about a creature was to dig up its home, and frighten it out of its wits, and kill it; and after a few moons of that sort of foolery they claimed to know all about us. Us! whose ancestors knew the world millions of years before the ignorant Humans came on the earth at all." 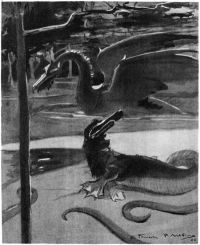 The Platypus spluttered out more dirty water, in its indignation.The Kangaroo became very timid, as it saw the rising anger of the Platypus, and it whispered to Dot to say something to calm the little creature. "A million years is a very long time," said Dot; unable at the moment to think of anything better to say. But this remark angered the Platypus more, for it seemed to suspect Dot of doubting what it said. It clambered up into a more erect position, and its little brown eyes became quite fiery. "I didn't say a million; I said millions! I can prove by a bone in my body that my ancestors were the Amphitherium, the Amphilestes, the Phascolotherium, and the Stereognathus!" 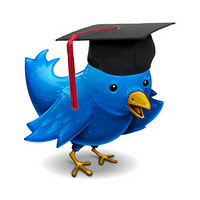 almost shrieked the little creature." (PEDLEY, E.C. 1899: "Dot and the Kangaroo" is an Australian child-book). "FOSSIL MAMMALIA OF STONESFIELD: The laminated oolitic limestones of Stonesfield have yielded some of the most precious relics of the past ages of our globe - of the known vestiges of mammalian animals in the secondary formations, in other words, in deposits of an age long antecedent to the mammaliferous eocene epoch :-a fact of the highest interest to the geologist, since it carries back the existence of the higher vertebrated animals to a period of unfathomable antiquity. 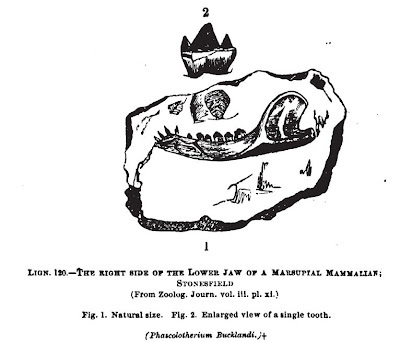 The mammalian remains hitherto discovered comprise, firstly, a portion of lower jaw, with teeth, of a small pachydermatous animal (the Stereognathus),* nearly related to some of the Eocene mammals, such as the Hyracotlierium and Plioloplius; and, secondly, at least seven specimens of portions of lower jaws, with teeth, belonging to very small animals, and referable to two genera. One of these is allied to the Wombat (Phascolomys), a marsupial animal of New South Wales; proving that the remarkable character of the mammalian fauna of Australia also prevailed in a very remote period, and that it is not, as some have inferred, a new order of things. The other was a small insectivorous mammal (Amphitherium), having thirty-two teeth in the lower jaw; its marsupial affinities are doubtful. *Emmons's Dromatherium, from the Chatham Coal-field of North Carolina, and Plieninger's Microlestes, from the Wirtemberg Bone-bed, are Mammalia of still more ancient date." N.B. : Tritylodont teeths, like described by Mantell, were discovered between 1847 and 1866 in the Keuper of Württemberg and described as genus Microlestes and Triglyphus, today the remains are attributed to the genus Tritylodon, described by Owen in 1884 from fossils of Karoo, regarded as a member of the Cynodontia. Also the attribution of all the described fossils to Australian marsupials or monotremates is erroneous, in fact these remains are today classified as a separate mammal group, the Multituberculata s.l. Fig.1. Phascolotherium bucklandi, from MANTELL 1859. Fig.2. Amphitherium prevostii, from LYELL 1871. Fig.3. 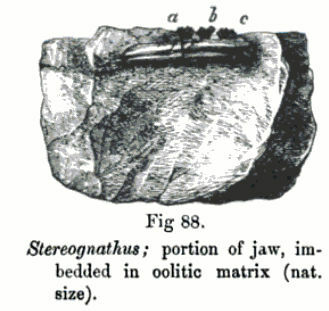 Stereognathus, from OWEN 1860. 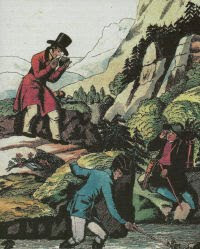 These observations are made to prepare the reader to appreciate more justly the interest felt by every geologist in the discovery in the Stonesfield slate of no less than ten specimens of lower jaws of mammiferous quadrupeds, belonging to four different species and to three distinct genera, for which the names of Amphitherium, Phascolotherium, and Stereognathus have been adopted. The second mammiferous genus discovered in the same slates was named originally by Mr. Broderip Didelphys Bucklandi, and has since been called Phascolotherium by Owen. It manifests a much stronger likeness to the marsupials in the general form of the jaw, and in the extent and position of its inflected angle, while the agreement with the living genus Didelphys in the number of the pre-molar and molar teeth is complete. In 1854 the remains of another mammifer, small in size, but larger than any of those previously known, was brought to light. The generic name of Stereognathus was given to it, and, as is usually the case in these old rocks, it consisted of part of a lower jaw, in which were implanted three double-fanged teeth, differing in structure from those of all other known recent or extinct mammals." Fig.4. 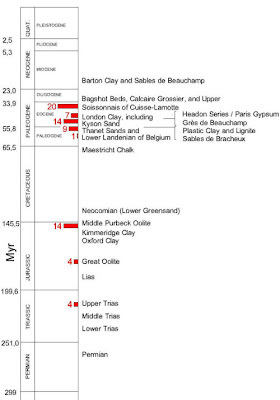 Stratigraphic range (adapted to the modern subdivision) of the fossil mammal -specimens (red bars and numbers) mentioned by Lyell in 1871. LYELL, C. (1871): Elements of Geology - the Student's Series. PEDLEY, E.C. (1899): Dot and the Kangaroo.